One of the best things about being a blogger is when I am sent products that I otherwise would not have tried. A wonderful example of this is Newman’s Own. Last year I had the opportunity to sample and review a wide variety of their products. Since then I have seeked out Newman’s in my local stores, and am determined to sample everything they have to offer. Since I have began this quest I have developed some favorites, that also happen to make the perfect back to school snacks. Newman’s Own Organic has a wide range of products that go from salty, sweet and over to sour. As a bonus and in addition Newman’s Own goodness extends beyond just food and into the charitable world. This entry was posted in Food and Drink Products, Giveaways, Reviews and tagged giveaway, giveaways, JennifersFavorites, Natural, organic, snacks on September 10, 2016 by Jennifer. Let me start by saying that the products featured in this post were provided to me free of charge courtesy of Perfect Bar. This post may have affiliate links but this in no way will influence the review to follow and all opinions are my own. I am a San Diego girl – I was raised here and I love it here, when I have moved I have always ended back here. An extension to my love of San Diego is I love to support San Diego based businesses like Perfect Bar. Perfect Bar had its start in the family. As the children of a health and fitness man, Dr. Bud Keith’s children would sell Perfect Bar’s in the same manner as lemonade stands. The children had big dreams – to share this recipe with more than just family and friends. After their father got sick, and having 13 children to provide for, the eldest siblings got together and turned their bars into a real company. Unfortunately, their father passed, but taking those lessons and words and making them into action is what the goal of the children are now. The siblings know that it is not just one thing that goes into a “Perfect Bar”, but a compilation of many things. Perfect Bar are Non-GMO and not only do they verify prior to making the bars, but they also test the finished product. The Perfect Bar is always gluten-free and contains over 20 organic super foods (such as kale, spinach, alfalfa and celery to name a few). Using organic honey as a sweetener, the complete carbohydrate helps maintain energy levels. These are different bars as they are refrigerator stable for 9 months due to the natural preservatives in honey.The low glycemic flavors use organic dates as sweeteners, and NEVER use refined sugars. This entry was posted in Food and Drink Products, Giveaways, Gluten-Free, Reviews and tagged Food, Gluten free, Natural, product review, San Diego Business on October 7, 2015 by Jennifer. Let me start by saying that the products featured in this post were provided to me free of charge in consideration of a review from Hyland’s Homeopathic . This in no way will influence the review to follow & all opinions are my own. “I get knocked down but I get up again” are not only lyrics to a popular 90’s song but really the story of my life 2-3 days a month. As my chronological age has progressed, the severity of my monthly menstrual cramps have as well. For that 2-3 days a month I am held hostage by cramps to severe to function. I have tried many remedies for these over the years including heating pads, ibuprofen, hot showers, chamomile tea and wishful thinking. I am always open to trying something new to relieve the discomfort that I feel each month. 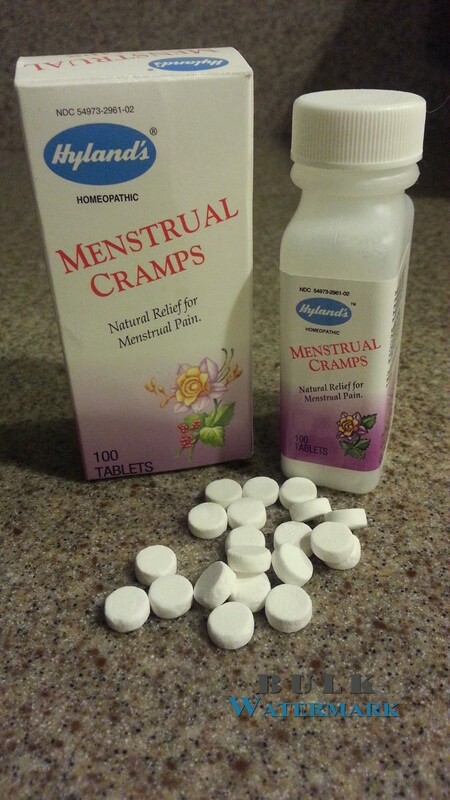 I was given the opportunity to review Hyland’s Homeopathic Menstrual Cramps tablets. I figured no matter the result a little relief is better than none at all. There are 100 tables in the bottle, and it is recommended to dissolve 2-3 tablets under your tongue every four hours. It takes very little time to dissolve the tablets, less then 20 seconds total. The idea behind the homeopathic tablets is that they assist by stimulating the body to safely heal itself. Instead of suppressing the symptoms like many over the counter medicines do, Hyland’s tablets uses natural ingredients to help the body do what it wants to do naturally. This entry was posted in Original Content, Reviews and tagged Health, Natural on March 24, 2015 by Jennifer.